Beauty and grooming isn't just for women anymore. These are just a few tips on what a man would consider having on his side of the bathroom, toners and moisturizers would definitely be included. When a man shaves, this is a form of exfoliation. Once you exfoliate your skin you have to bring your skins pH back into balance, which in essence is balancing out the condition of your skin. Some would consider an after-shave lotion to be good but toners are also good. Even though I would suggest something with rosewater, it doesn�t mean it's going to be on the feminine side. 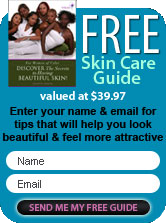 It�s just helping you as a male take care of the condition of your skin. When you use a rosewater toner, it helps to balance out the skin in general. It�s one of the highest vibrating essential oils that can be used and it's definitely one of the best oils that can be used on your skin. Once you shave, which is a form of exfoliating, and then you use a toner (and rosewater is what I suggest), you will then use a moisturizer because your skin will be asking to be moisturized and softened. A moisturizer will help you in alleviating a lot of the razor bumps that are developed as part of the shaving process. Moisturizers are good for bringing your skin back into a state of growth. The moisturizer helps to build and nourish your skin and in doing so it will help you, as a man, be able to have those benefits for your skin. Some of you use shaving brushes and soaps and you use a shaving brush to create lather because it creates a shaving base in order to remove the hair. If you can find something that's Shea butter based, it will be like a nourishing food that's being used in order to treat your skin and keep your skin soft and moisturized as you shave. Sometimes soaps can be very harsh and drying to your skin. And there's nothing like using a product that's drying on your skin because then your skin feels as though you're having a tug of war with it as you shave. If the soap is drying you out and then you're using a razor, not only will that cause friction to your skin, it's going to cause trauma as well. My suggestion for having and using a shaving cream would be for you to use use products that are Shea butter based or have a "lactic" acid base. Lactic acids are milk-based products and when enhanced with green tea it's the perfect shaving cream. Once you've used this particular product, it's going to allow you to come back again and use your toner and your moisturizer. If you use a Shea butter or lactic acid base, depending on your skin type you may not need to moisturize. You would simply come back to use the rosewater toner and sometimes toners can be used as an after-shave splash. You don't always want them scented, but if you do want them scented then something with the rosewater or tea tree would be excellent in treating your skin as you�re using this splash on your face. These are just a couple of tips for your beautiful black skin as the men of our space. These tips are to help you nourish and nurture your skin in the process of shaving.